The machines I (RE)played on, during my Winter Vacation! 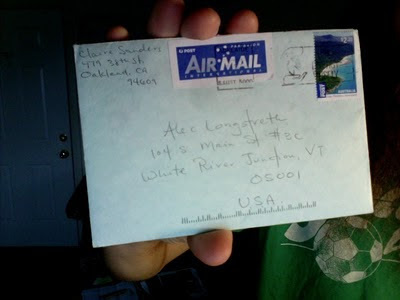 If you've read Drop Target #1, you know that Jon and I live in a tiny town in Vermont. For Christmas I went home to Seattle, which means that I had to stop over in an in-between city, to catch my flight. For various reasons, I chose to fly out of New York City. And while there, you know what I did! 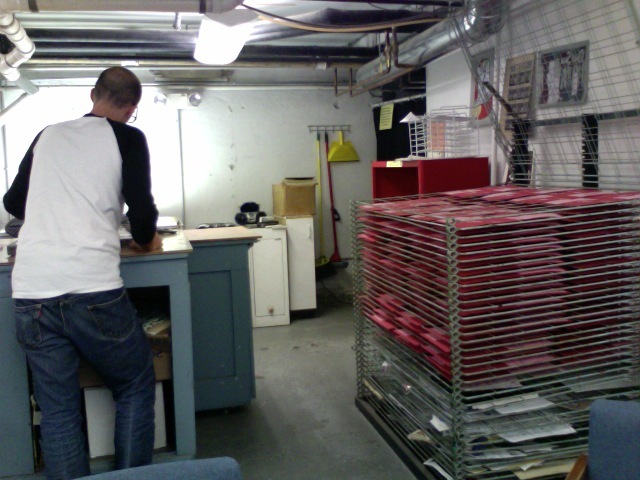 My first stop was at Reciprocal Skate Shop on the Lower East Side (402 E. 11th St. - by the corner of 1st Ave). Jon discovered this place over Thanksgiving break and it was everything he said it would be. 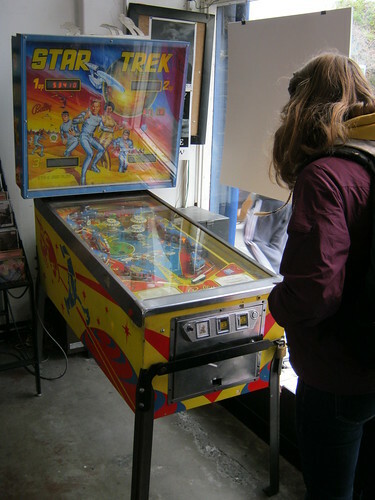 The proprietor, John, is a super pinball fanatic, and he's got four machines crammed into his tiny storefront (when I was there it was The Getaway, Creature From the Black Lagoon, World Cup Soccer and Dr. Who). He said he had another 15 or so machines in his apartment and in another space and he often swaps them out. He was super friendly and loved talking pinball. This shop is just a short walk from the 1st Ave stop on the L train, or from Union Square. Swing by next time you are in New York! 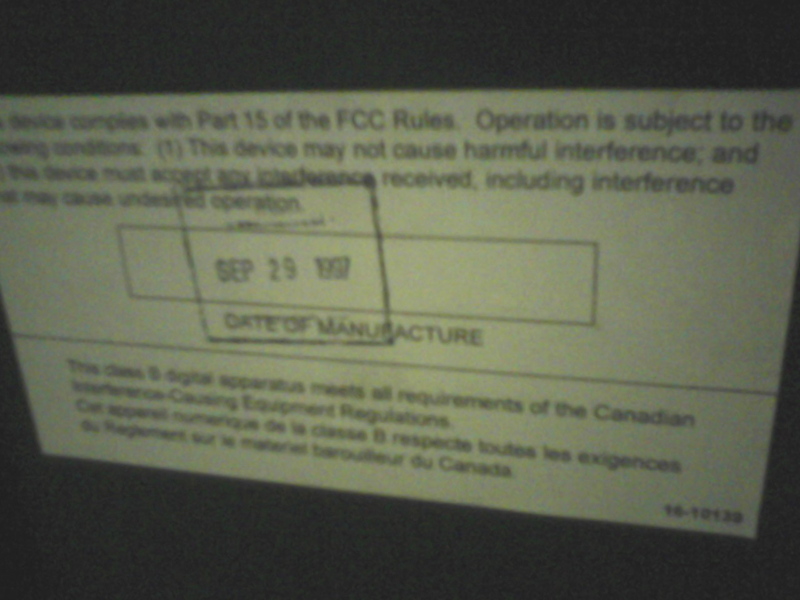 As you can see here, I also got a replay on Stern's 2008 Indiana Jones machine. 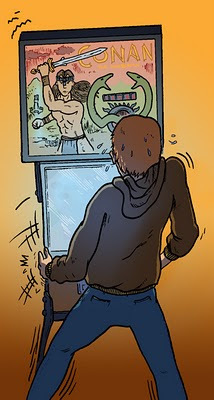 I must say, I had more fun playing Indy and Iron Man than I have ever had playing other Stern machines. 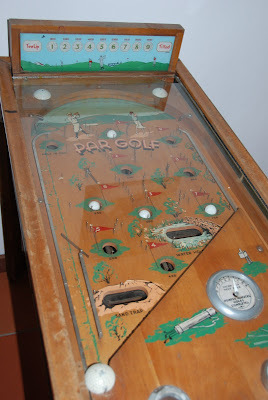 I opened the Ark of the Covenant at one point, which dumped FOUR balls onto the playfield, which was intense! I only regret that I left the bar without playing their Sega Starship Troopers. 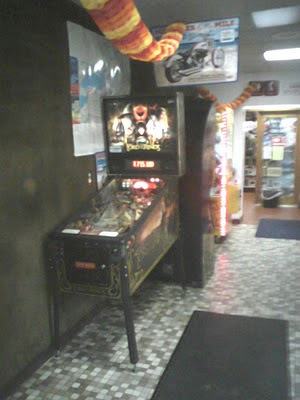 T2 was no big deal, as I live above a pizza place that has that machine, so I know all the shots. It was my first replay on Addam's Family though. I played a TON of new machines, but the two I spent the most time on were Cirqus Voltaire, which was SUUUUUPER crazy and fun, and Tales of the Arabian Nights which I became totally obsessed with. Both of those games have some really innovative playfield parts and awesome ramp shots. Every machine I played at Ground Kontrol was in perfect condition. Their dedicated repair person was working on machines as I was playing and I thanked him for keeping the machines in such great order. Hands down, this is the best place to play pinball in Portland, if not the entire West Coast. That night I ended up at Slabtown with Gabe (back in Portland for Christmas with HIS family) and Grizzo. Sadly, the change machine was broken, and at about midnight the bartender said he couldn't give us any more quarters. It was Sunday night, the day after Christmas, so Grizzo had little luck getting a roll of quarters from a few other neighboring businesses. 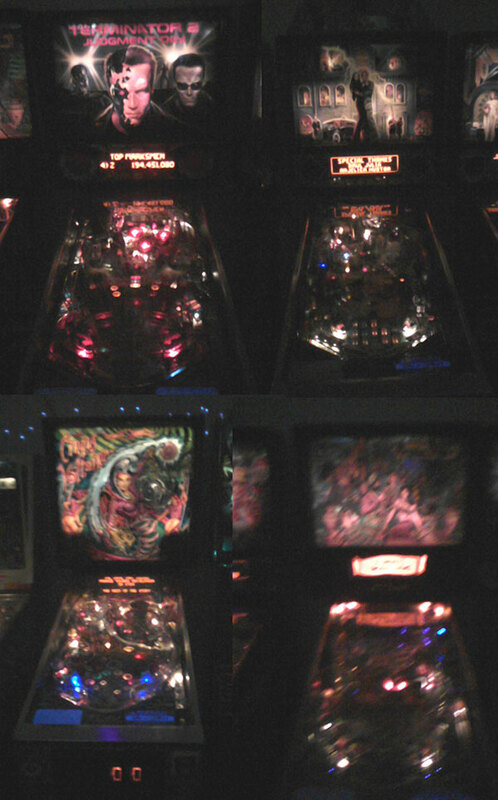 Also, about half the machines were either broken or so filthy they were not really fun to play. It was sort of a bummer ending to my Portland Pinball Playing, but I was not done yet for this trip to the Pacific Northwest! 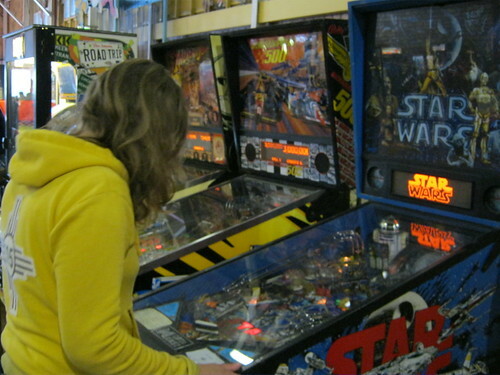 Nope, on my last day in Seattle I swung by Shorty's for a few last hours of Pinball. They had the newest pinball machine, Avatar, which I did NOT enjoy playing (too many toys, not enough ramps, weird elongated flippers). 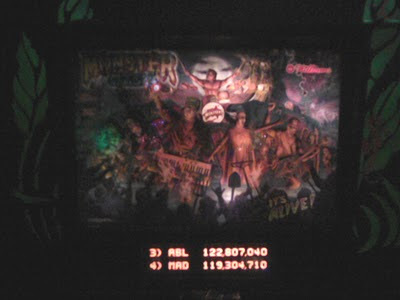 I played a lot more Arabian Nights, some 1993 Indiana Jones, and then Monster Bash, where I had my best game of the entire trip. I collected all six monsters and their instruments, thus starting the Monster Bash, where every shot was worth 2 Million. I ended up with 122 Million, which was a #3 High Score. 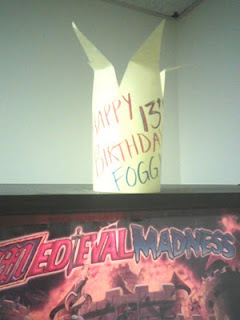 Putting up a score in a real pinball bar like Shorty's felt like quite an accomplishment! Sorry if this reads like me bragging about my scores, it's just really satisfying to see myself getting better and better at pinball. Each time I go out and play "in the wild" I can see a marked difference from the last time I played. At first I couldn't get a replay at all, and then a few months later I could get a replay on games I had played a lot. And now, I feel like I can get a replay on almost any machine if I play it half a dozen times. I know I still have so much more to learn, so all I can do is keep practicing! I've added some of these bars to our "Pinhalls" side menu, so check them out if you are in the areas I mentioned. And like Jon said in his last post, Happy New Year! 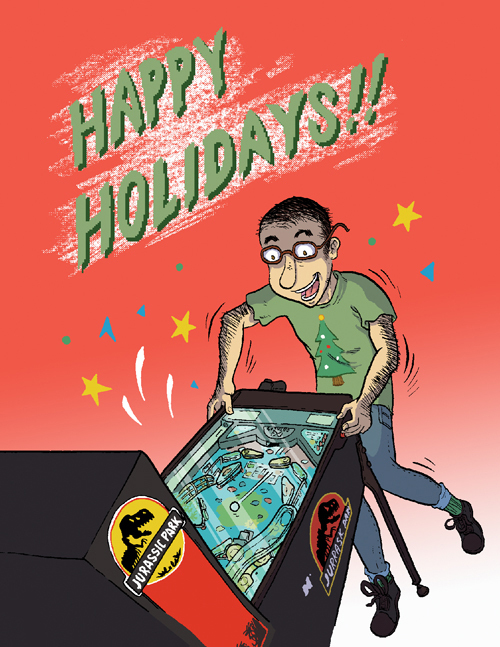 Let's make 2011 a year filled with all kinds of pinball fun. HAPPY NEW YEAR EVERYBODY!! Does everybody have a good New Year Resolution? Does it involve PINBALL?! I used to think that New Year Resolutions were a joke and a half, but a couple of years ago I made one and totally stuck to it. It's doable. 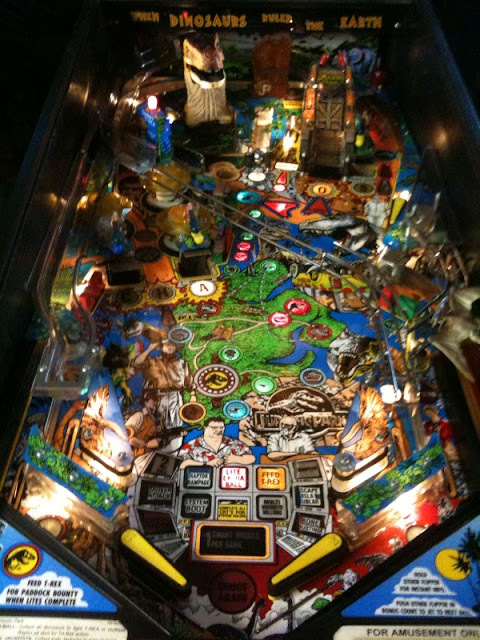 My big pinball plan for 2011 is to finish shopping out my Jurassic Park machine and have it ready to trade / sell / show at the new pinball festival in Pennsylvania. Also, Alec and I plan to have another issue of DTZ out sometime in the spring. 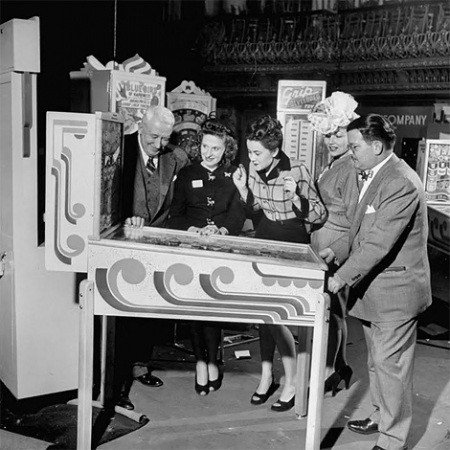 Keep your wrist-radios tuned to this channel, pinballers! Also, it's no secret that the Pinball Hall of Fame is located in Las Vegas! Needless to say, I CAN'T WAIT. 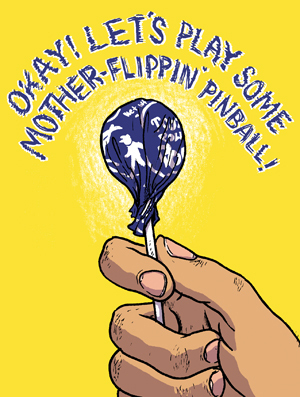 I have some REALLY killer pinball illos I've done lines up for the next couple weeks! Be forewarned, though, some of them are WEIRD. Happy Holidays everybody! Anyone that flips the ole silverball with me can tell you that I LOVE THE HOLIDAYS. I love the food, the music, the snow; EVERYTHING. I'm actually not terribly keen on the actual day, but all the days leading up to Christmas are awesome. Gentle readers, what is it that YOU want for the holidays? I was visiting some friends in Burlington Vermont this weekend and two cool pinball things happened. First, I need to preface this story with the fact that there are NO PINBALL MACHINES, AT ALL, in all of Chittenden county (a large chunk of VT that includes Burlington, Colchester, Winooski, Essex, and my hometown of Essex Junction). "Guys, Jon and his friend have two pinball machines that they maintain, and I've played them, and it's the best thing ever. They're LITERALLY living our childhood dream. Remember the old Aladdin's Castle arcade in the U-Mall? Remember how we used to run out of quarters? 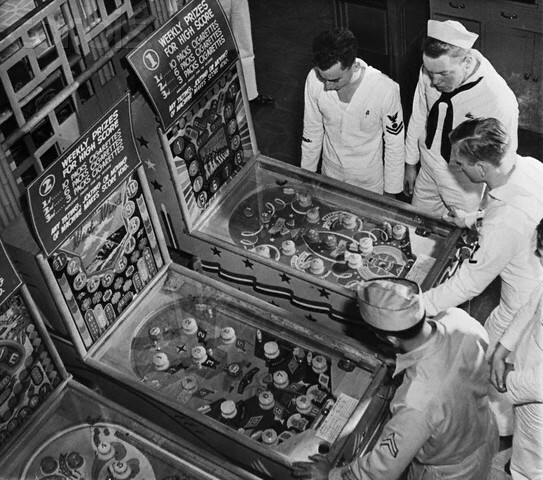 Well, remember how much fun that place was, but then imagine NEVER RUNNING OUT OF QUARTERS." 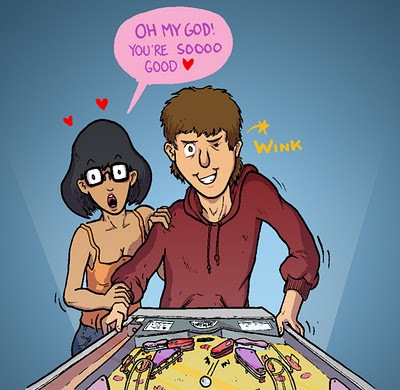 It was just one of those awesome, I-love-pinball, kind of moments. 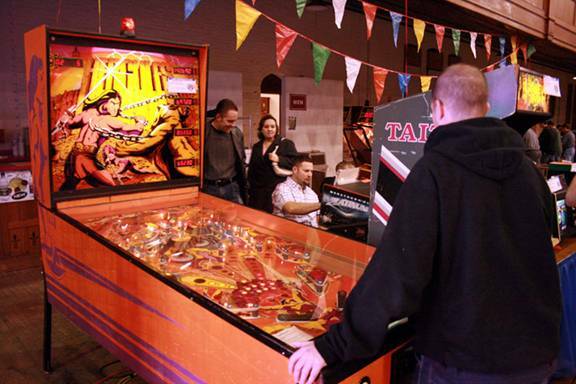 2) A friend of mine that works in the Essex Outlet Cinema told me that he urged his boss into getting a pinball machine for the lobby!!! Apparently, it's a Sega South Park, which I've played before. It's a pretty fun machine! I can't wait to give it a whirl. It's a pinball oasis in an otherwise pin-barren sea. Well, that's all I've got for you true believers over here at Jon Chad HQ. Stay warm and have a great week! 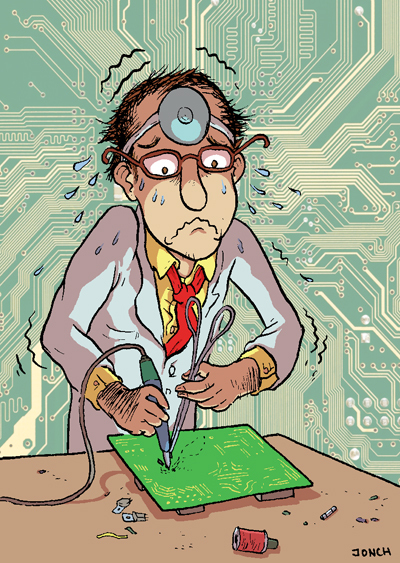 Just another image from what was going on in my mind's eye when I was fixing my Jurassic Park's circuit board. It was probably the most stressful thing I've ever done. The relief / satisfaction that coursed through my youthful veins when I turned on the machine and realized I hadn't f***ed up th machine was beyond articulation. Hey! Hey! Did you guys hear that the Allentown show was shut down?! I was super bummed because Alec and I were so gun-ho on attending. Almost IMMEDIATELY, though, someone else bravely picked up the reins and decided that the show must go on! So, I think the show is now called PinFestival. It's going to be held around the same time in May that Allentown was held and in pretty much the same area. I think it's safe to say that the Pinheads here at Drop Target HQ are pretty pumped about going! 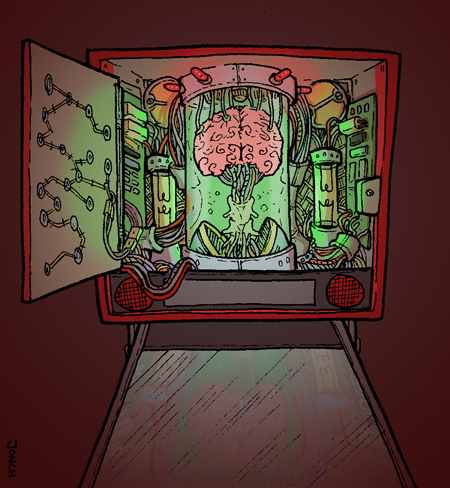 Alec and I joke ALL THE TIME about how the backbox of the machine is the "brain". 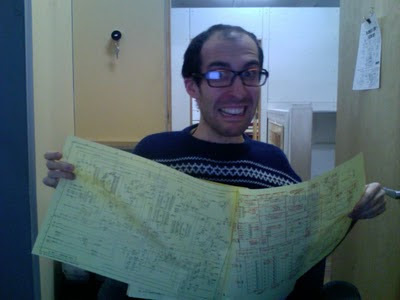 This probably contributed to my paralyzing fear of fiddling around with the circuit board. I really liked how this one turned out. 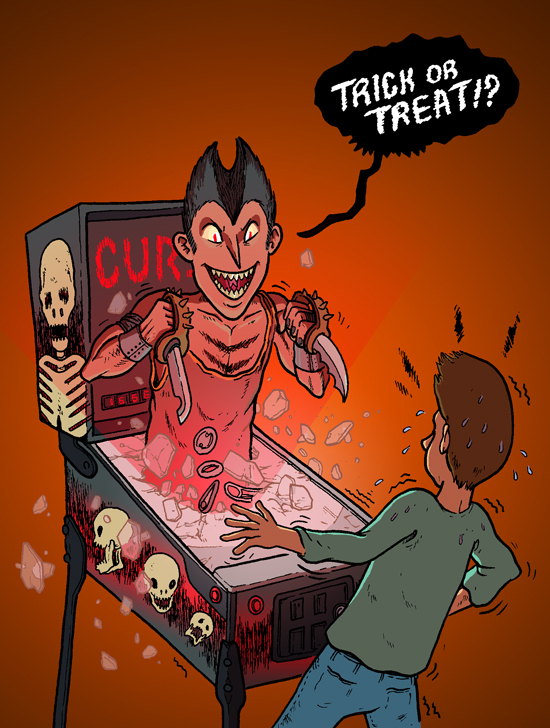 Go play some pinball, y'all. 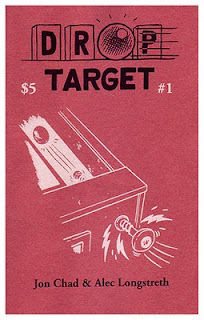 Microcosm now carries Drop Target #1! 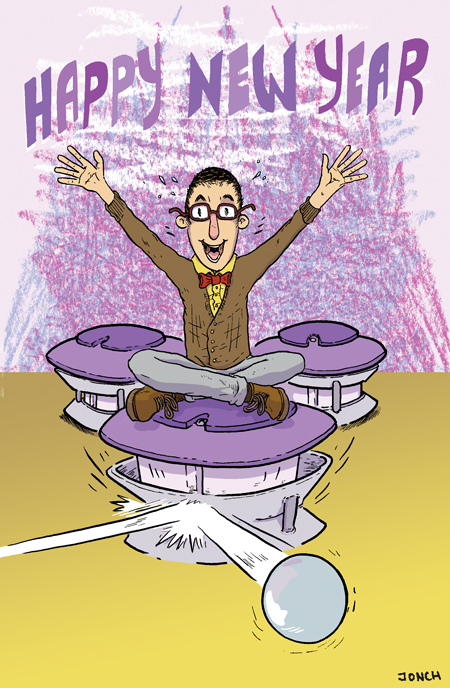 Hey everyone, just a quick update to let you know that Microcosm Publishing is now carrying Drop Target #1! So now you can either order Drop Target #1 directly from us, or lump it in with a BUNCH of awesome zines and minicomics from Microcosm. We are slowly but surely getting our plans together for Drop Target #2, which we are still hoping will be out this spring. 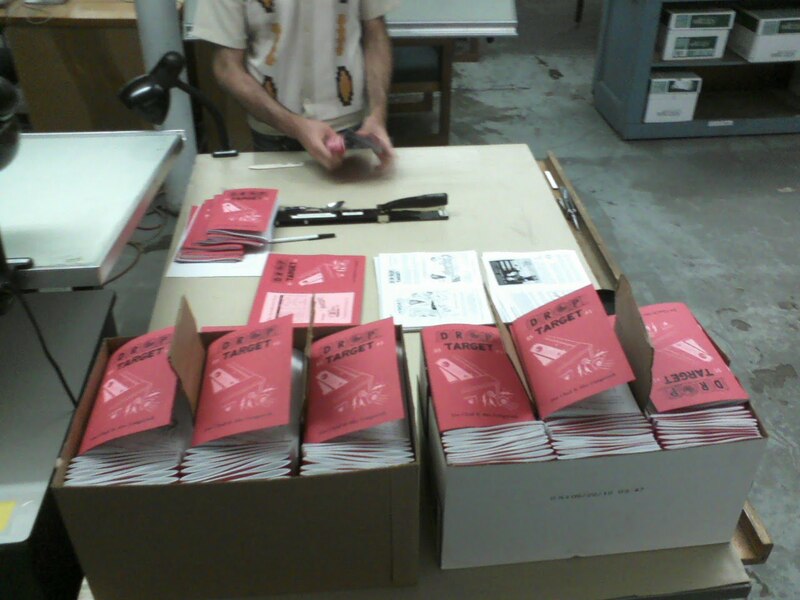 There's a lot more on the way, so we'll keep you posted! !!?!?!?!?? Designed by George Gomez?! 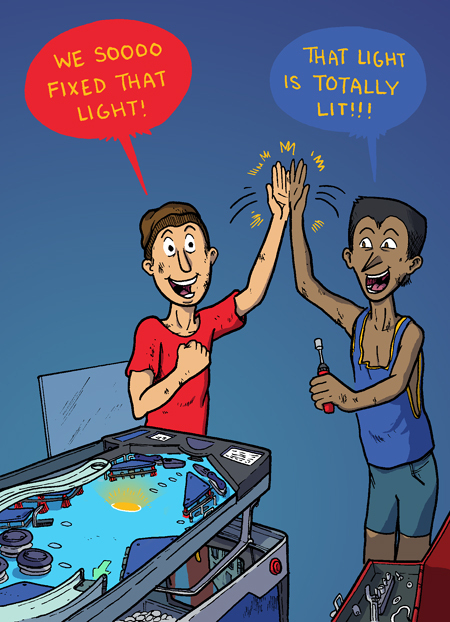 Connect multiple pinball machine together for cooperative gameplay!?! Why have I NEVER heard of this!?! Can you even imagine how amazingly cool that would be!? Discuss!! Man, oh man, another horrendous pinball fate that I wouldn't wish on ANYONE; having your quarters eaten by the machine. Drawing the mouth on the pinball machine was probably the best thing ever. 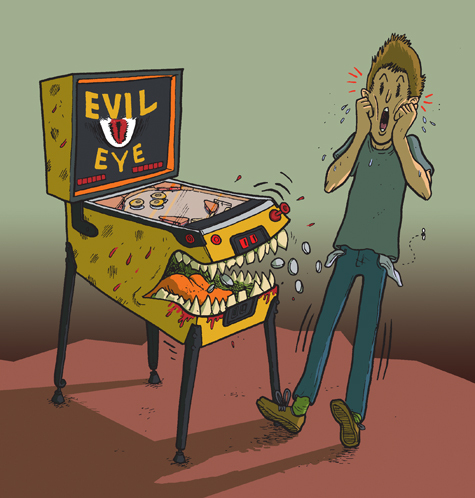 I thought about having wires, coils, and 555s coming out of its mouth, but with a game named "Evil Eye," there's much more sinister stuff going on under the glass. So, the big news that I wanted to write about today was that I have brought my Jurassic Park machine back from the grave! "But Jon Chad?" I hear you cry "I never even knew that the JP machine was down?" Yes, unfortunately, three weeks ago, I went into the backbox to try and figure out what was causing my game to randomly reset. It used to happen once in a blue moon, but it had started happening constantly. I couldn't get through a whole game without it rebooting and running the T Rex diagnosis. So, I had read on the This Old Pinball Data East guide that one of the common causes of game reboots was contact between the sound board and the metal mounting plate. I removed the sound board and found nothing wrong. 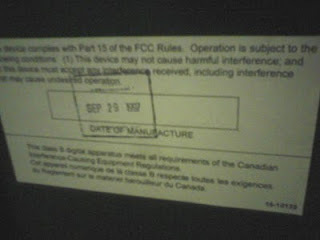 On further inspection of the boards, though, I found that the CN1 and CN8 power connectors on the Power Supply board were completely fried. I removed both plugs to inspect the damage. When I plugged them back in and turned on the machine, the thing went completely dead. Nothing. Nada. NO WORRIES, though. I decided that I needed to rise to the challenge and fix my baby! I poured my heart and soul into electrical diagrams and figured out how circuit boards work. So, last Saturday, I very nervously opened up my machine, removed the power supply and CPU boards, and replaced the faulty components. It was honestly the scariest thing I have ever done in my life. Well, I was super duper nervous in any case. After all was said and done, and the machine was put back together, I held my breath as I turned it back on. There were absolutely no problems with the machine. No random resets, no sound cutting out, and the T Rex moved its head just like it should; diligently searching for the ball. I can't tell you how exciting it was to take a machine and breathe life back into it. 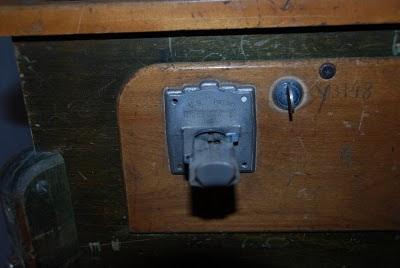 I know that there are probably some pinball mechanics out there thinking, "hmph, all that Jon Chad kid did was replace a Molex power connector and a couple transistors? YAWN. Par for the course!" Well, to me, it was the most exhilarating and rewarding thing ever. 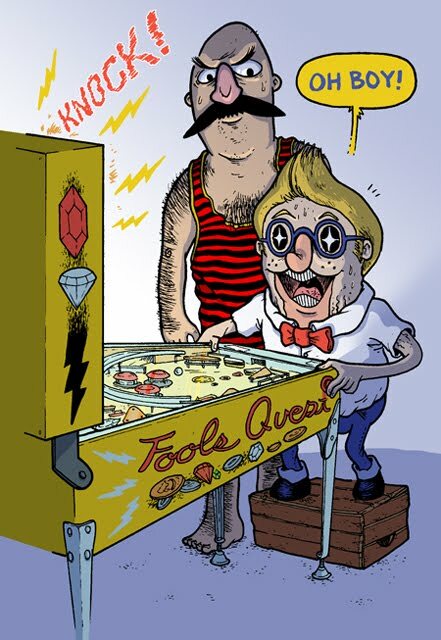 I LOVE PINBALL! 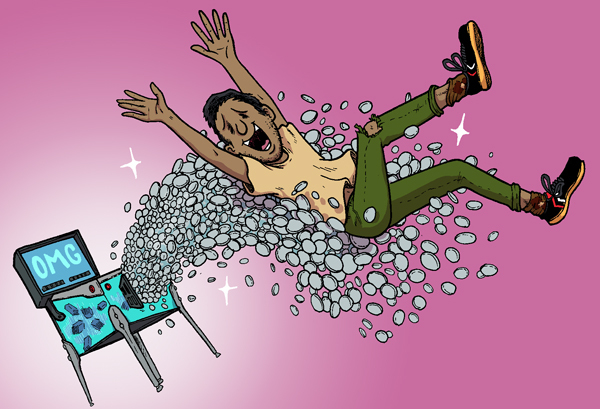 My illustrator friend Rosemary Travale sent me this great video about the Pacific Pinball Museum (aka "Lucky Juju's") This is one of my favorite places to play pinball. It's $15 at the door and they have three rooms full of pinball machines, from all different eras, all set to free play. 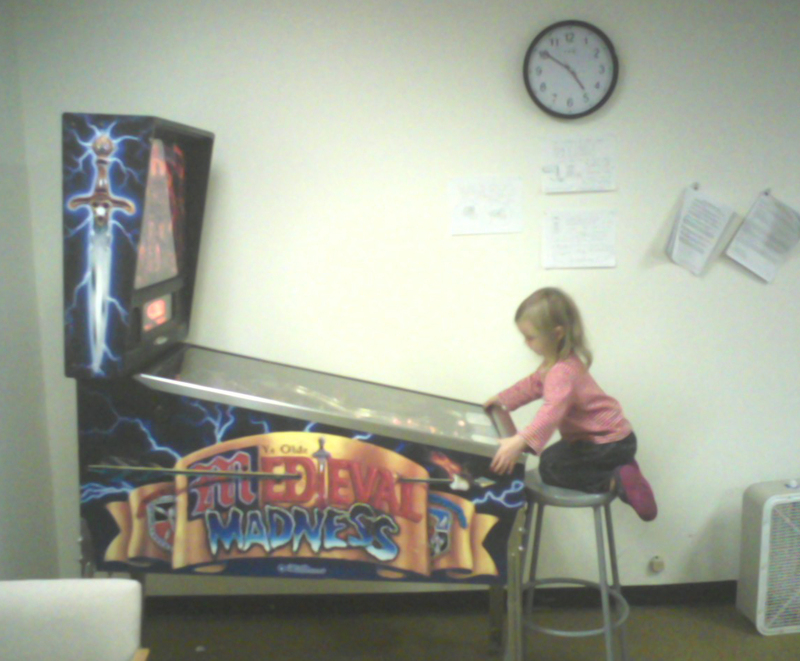 You can actually play pre-flipper machines, a wide range of EM machines and a whole room full of the best solid-state machines from the 80s and 90s. They also have juke boxes with era-specific music in each room, which are also set on free play. If you are ever in the bay area, you NEED to check it out. Anyway, check out this great video to learn more about this important pinhall! Last weekend we had a visit here at Drop Target headquarters from a real pillar of the pinball community: Dave Marston, long-time contributor to PinGame Journal. 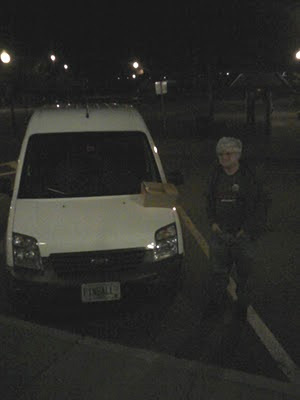 He traded me a photocopied stack of his "Pinball on Record" articles for another copy of Drop Target #1 for his archives. We also played some pinball and spent an hour or so chatting about the current state of pinball and our plans for future issues of Drop Target! Coolest of all, he rolled into town in a van big enough to haul some pinball machines, with a very special license plate... :) Thanks for swinging by Dave. Hopefully we'll see you again soon! A few weeks ago, I ran into my colleague, Jason Lutes walking down the street with his two children, Clementine and Max. He told me they were heading to go check out my pinball machine for the first time, so I decided to tag along. We set Clementine up on a stool and she could just barely reach both flippers. At first she just started flipping the flippers as fast as she could. But then we explained that she should try to hit the ball, and all in an instant she GOT IT. She started waiting for the ball to near the flipper and then she would carefully push the button and send the pinball back up the playfield. It was really amazing to see someone play their very first game of pinball, especially someone so young. 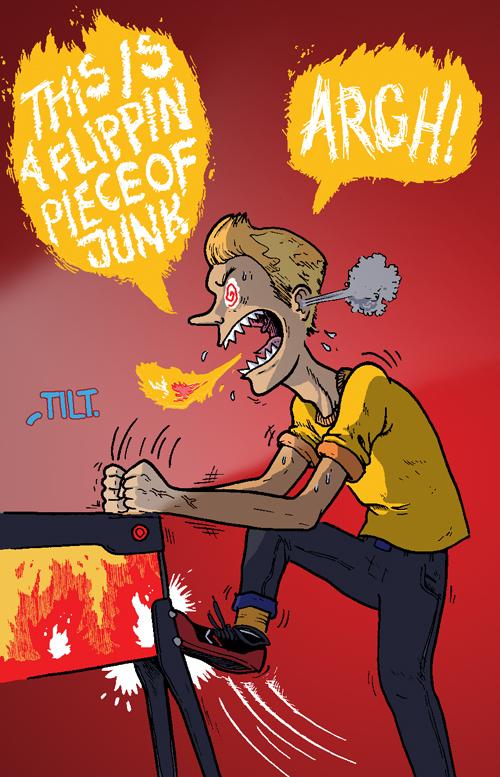 It made me realize just how intuitive pinball is. It's such a simple interface, anyone can play! 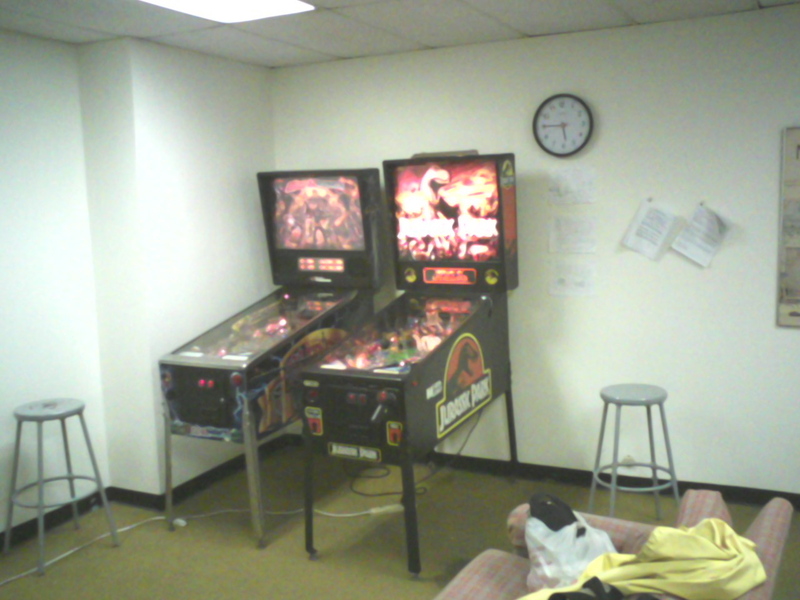 As we all know, Alec has a Medieval Madness machine and I have a Jurassic Park machine. When Alec came with me to come get my machine, I drew this for him as a present. Here's a colored version. 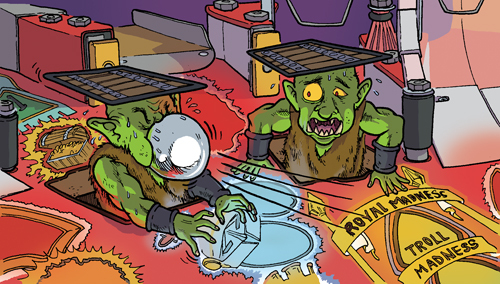 Out of all the awesome stuff on Medieval Madness, my favorite is probably the trolls. I love everything about them; how they announce themselves, the dot matrix animations, their voices, etc. We even went so far as to name the trolls (because, as far as we know, they don't have names...). The one on the left is named Herman, and the one on the right is named Pee Wee. Ha ha, get it? The best part is that Pee Wee is kinda a wuss and if you even hit him from behind, he'll count it as a hit sometimes. The really magical thing about the trolls is thinking about the what the ball represents, in this case. I've heard this question come up again and again when talking about certain game: "What is the ball supposed to represent? Is the player the ball?" On games that have distinct narratives, it's easy to try and project oneself onto the ball. Overall on a game, that can get confusing. I try to think of it, mode to mode, what am I trying to achieve, and what is the ball representing at that moment, or geez...WHUTEVAH. Both of which are ideal situations. Jon and I both work at The Center for Cartoon Studies in White River Junction, Vermont. Each year CCS has a fellow, and last year it was the Belgian cartoonist Max de Radiguès. 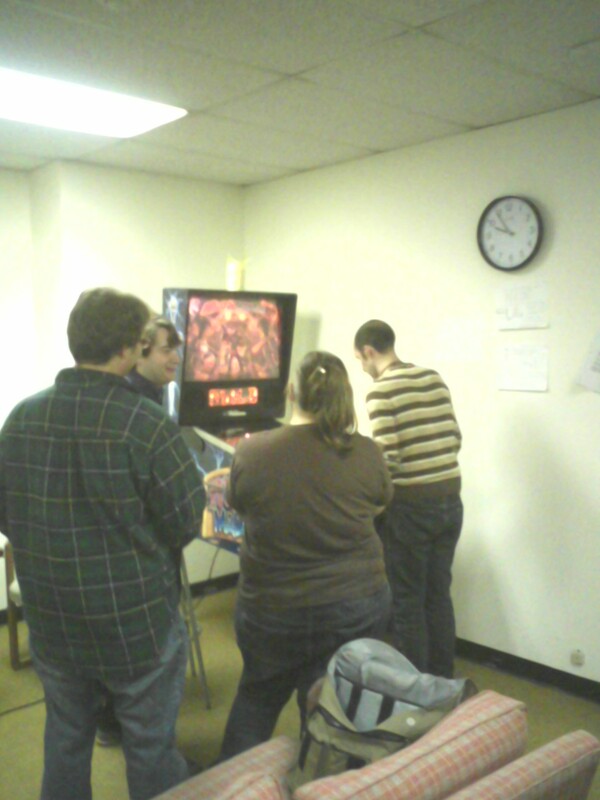 Max appears a few times in Drop Target #1, and played pinball with us almost every day last year. 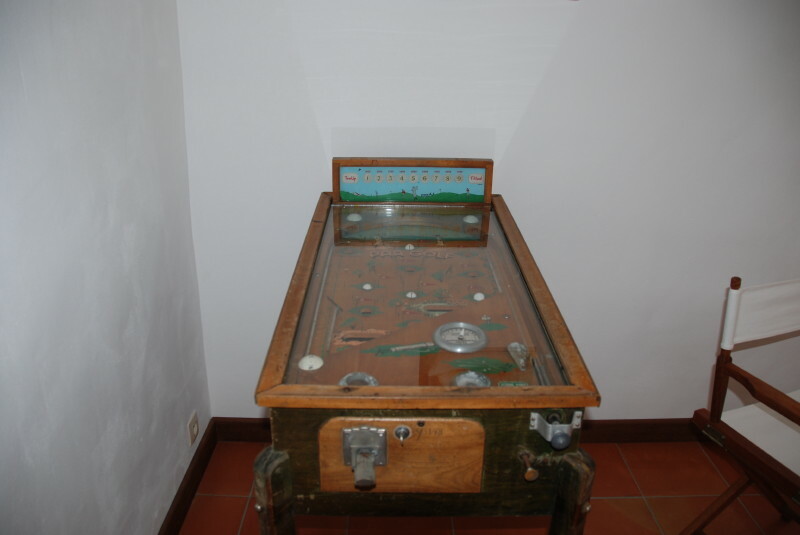 Max would often mention an old pinball machine that his Dad owned, and a few weeks ago Max visited his father in the south of France and he took a few pictures of it, which he forwarded to me and Jon. It appears to be a 1935 Par Golf which is a pre-flipper machine. Thanks Max! Aww man, talk about dropping the ball on this one! I finished this thing, no kidding, like, three weeks ago. "Good time management, Jonch" I thought to myself, "Now all that's left is to just sit back and post this on SUNDAY, which just so happens to be HALLOWEEN!" Man oh man, dropping the ball. The shot was all set up for me, and I let it drain right down the middle. This image is horrifying, btw. All I could think about as I was drawing / coloring it was how I would have died from a heart attack on the spot if this happened to me. I'd like to think that you could tilt him away.